On the bright afternoon of 4 November 2012, Ramlila Maidan was full to capacity. It was bursting at the seams in fact. The people, apparently, have responded to the call of Indian National Congress, political party leading the United Progressive Alliance government running the country, rather enthusiastically. Or they were, at least made if the rumours of thousands of buses belonging to Haryana and Rajasthan state roadways transport corporations were to be believed. Yet one thing was clear that there was no coercion. The Congress ruled states had not forced people to flock to the rally as the only allegation opposition parties could make was the age old favourite of all parties that find themselves in opposition; that the state governments had misused their power and resources to make the rally a successful. So all these people, more than a 100,000, had come to Ramlila Maidan out of their free wills at best and were lured, at worst. One can, therefore, safely assume that these many people, at least, stood in robust defense of an embattled government facing the allegations of being neck deep in corruption. Calling these charges allegations is an understatement, in fact. 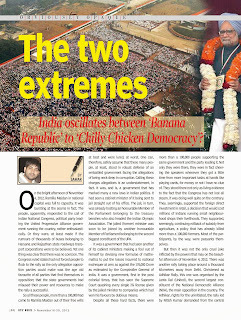 It was, and is, a government that has marked many a new lows in Indian politics. It had seen a cabinet minister of it being sent to jail straight out of his office. The jail, in turn, was already hosting a honourable Member of the Parliament belonging to the treasury benches who also headed the Indian Olympic Association. The jailed (former) minister was soon to be joined by another honourable Member of Parliament belonging to the second biggest constituent of the UPA. It was a government that had seen another of its cabinet ministers making a fool out of himself by devising new formulae of mathematics to put the losses incurred to national exchequer at zero as against the 176000 Crore as estimated by the Comptroller General of India. It was a government, first in the post colonial times, that has seen the Supreme Court quashing every single 2G license given by the jailed minister to companies which had won his favours by dubious means. Despite all these hard facts, there were more than a 100,000 people supporting the same government and the party leading it. Not only they were there, they were in fact cheering the speakers whenever they got a little time from more important tasks at hands like playing cards, for money or not I have no clue of. They stood there not only as living evidence to the fact that the Congress has not lost all steam, it was doing well quite on the contrary. They, seemingly, supported the foreign direct investment in retail, a decision that would cost millions of Indians running small neighbourhood shops their livelihoods. They supported, seemingly, continuing rollback of subsidy from agriculture, a policy that has already killed more than a 100,000 farmers. Most of the participants, by the way, were peasants themselves. But then it was not the only cruel joke inflicted by the powers that may on the beautiful afternoon of November 4, 2012. There was another rally taking place around a thousand kilometers away from Delhi. Christened as Adhikar Rally, this one was organised by the Janta Dal United, the second largest constituent of the National Democratic Alliance, the main opposition in the country. The Adhikar, rights for the uninitiated, the rally led by Nitish Kumar demanded from the central government was the special package for Bihar for giving an impetus to development of the state. Bihar is a poor state was the central logic behind the demand. And the government of this poor state had spent, as per most conservative estimates, nothing less than 50 Crores for making the rally a success. A whopping 17 Crore in the transportation head alone, spent on booking eight trains and 20000 buses to get the people to demand the adhikar. 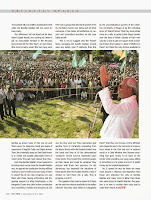 No one knows how much was the expenditure on the food and lodging for more than 5 lakh people who attended the rally. The estimates did certainly not include the cost to public exchequer that government departments like police and civil administration would have incurred for facilitating the rally. The rally turned out to be a huge success. It was bound to be for people like Anant Singh, JD(U) MLA from Mokama, fondly referred to as ‘don of Mohakah taal’ who has arranged 3000 small vehicles on his own. I am sure that no tax officials will ever ask him about the money spent, no one messes up with a don after all. More so, when the don is aligned with a Chief Minister promising good governance. Even more so, when this don is not the only one with the Chief Minister. Good governance comes at a cost. A cost of 800 quintal of chicken, the amount Hulas Pandey, a member of Legislative Council of Bihar and his brother Sunil Pandey, a JD(U) MLA and another ‘don’ arranged for feeding 100000 of ‘their’ people attending the rally. How would they recover the cost of good-governance-via-800-quintal-of-chicken is a question better not asked for one’s own good. These are the questions, at the same time, Indian citizenry can afford to ignore at its own peril. Question like where does the money for these quintals of chickens and petrol for thousands of vehicles come from must not only be asked, they must be asked in such venomous tones as unprecedented in the life of democracy of our nation. The reason behind this is simple, we don’t only need the answers, and we need them now. We need them now for we need to understand who these champions of our democracy are, where they come from and most importantly, where do they get their ‘supporters’ from? We need to know the similarities and difference, if any, between the ‘managers’ of the rally at Ramlila Maidan and the one at Gandhi Maidan. I tried, in fact, and tried very hard but could not manage to spot any differences other than the fact that the Gandhi Maidan one had a lot of former (?) ‘criminals’ who are now ‘honourable’ MLAs and MLCs hosting the event while the Ramlila Maidan did not, seem to, have many. The ‘difference’ did not stand out for long. Wasn't now cooling his heels in jail Gopal Kanda was an honourable minister in the Haryana Government till the other day? I am sure that a little more scrutiny would find out many such Kandas as proud hosts of this one as well. There were, for instances, loads and loads of supporters of Jagdish Tytler and Sajjan Kumar. Then, the criminality does not limit itself merely to visible and socially deplorable forms of violent acts. They get much deeper than that. On this count, the Ramlila Maidan crowd would seem fare much worse than the Gandhi Maidan one. 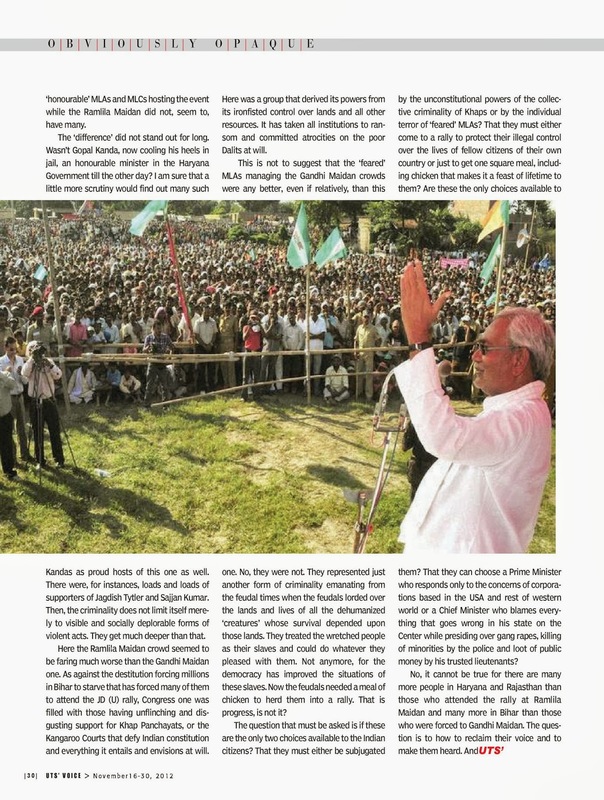 As against the destitution forcing millions in Bihar to starve that has forced many of them to attend the JD(U) rally, Congress one was filled with those having unflinching and disgusting support for Khap Panchayats, or the Kangaroo Courts that defy Indian constitution and everything it entails and envisions at will. Here was a group that derived its powers from its ironfisted control over lands and all other resources. It has taken all institutions to ransom and committed atrocities on the poor Dalits at will. This is not to suggest that the ‘feared’ MLAs managing the Gandhi Maidan crowds were any better, even if relatively, than this one. No, they were not. They represented just another form of criminality emanating from the feudal times when the feudals lorded over the lands and lives of all the dehumanized ‘creatures’ whose survival depended upon those lands. They treated the wretched people as their slaves and could do whatever they pleased with them. Not anymore, for the democracy has improved the situations of these slaves. 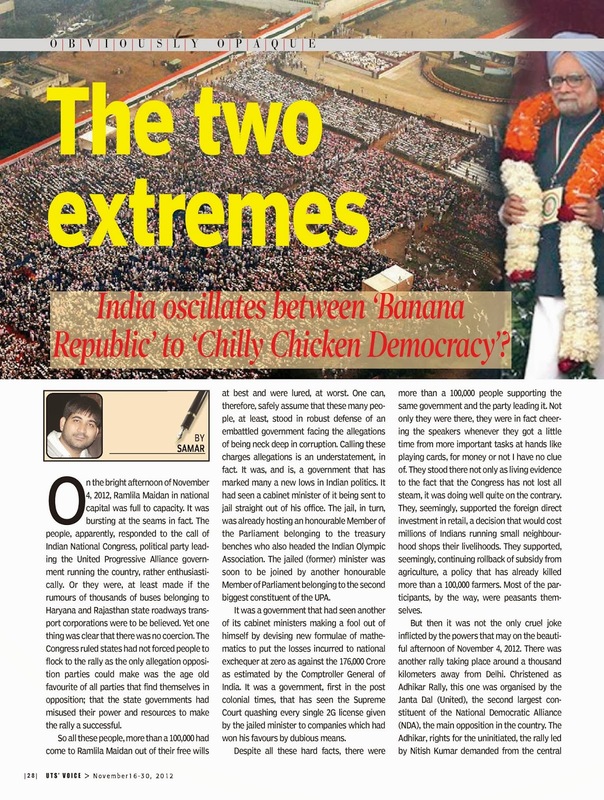 Now the feudals needed a meal of chicken to herd them into a rally. That is progress, is not it? The question that must be asked is if these are the only two choices available to the Indian citizens? That they must either be subjugated by the unconstitutional powers of the collective criminality of Khaps or by the individual terror of ‘feared’ MLAs? That they must either come to a rally to protect their illegal control over the lives of fellow citizens of their own country or just to get one square meal, including chicken that makes it a feast of lifetime to them? Are these the only choices available to them? That they can choose a Prime Minister who responds only to the concerns of corporations based in the USA and rest of western world or a Chief Minister who blames everything that goes wrong in his state on the center while presiding over gang rapes, killing of minorities by the police and loot of public money by his trusted lieutenants? No, it cannot be true for there are many more people in Haryana and Rajasthan than those who attended the rally at Ramlila Maidan and many many more in Bihar than those who were forced to Gandhi Maidan. The question is to how to reclaim their voice and to make them heard. And Count.